To make the marinade, combine the orange juice, lime zest and juice, chilli and oil. Add to a large marinading dish. Slice the kingklip into thin slivers and add it to the marinade, ensuring the fish is covered well in marinading liquid. Cover with clingfilm and chill for about 4 hours. Drain the kingklip from the marinade and arrange the fish slices on a plate or platter. 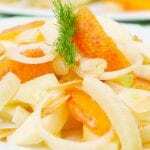 Arrange the fennel bulb slices and orange segments into a salad over the kingklip. Garnish with microgreens and fennel leaves. Place the reserved marinade into a jug and add a teaspoon of Dijon mustard, chopped coriander, olive oil and salt and pepper. Mix well then pour dressing over the salad.